The DéjàClick Sidebar contains two types of DéjàClick sidebars, Results and Properties. The Properties sidebar displays property panels for recorded web page elements, which provide many replay customization capabilities for your recorded script, so advanced DéjàClick users can configure the playback for their specific needs. Click on the DéjàClick toolbar to display the Properties sidebar on the left side of the main browser window. At the bottom of the sidebar, select a display mode from the Display Level drop-down list: Basic or Advanced. You can also change the display level with the Configuration Options dialog. The script properties can be customized as needed for a variety of reasons. To change or add a value to any property, just click the heading to expand the needed property section, modify the fields as required, and click Apply to save. For example, to provide a description of your script in the Script View window pane above the Properties panel, click the top line of the script (usually [Script 1] ), then click the Description section in the Properties sidebar to expand the property panel. Enter a suitable description of your script and click Apply. Below is a table showing the current list of DéjàClick options with a description and display level. Description: Enter free-form text into the box to describe the element. Description: Add free-form informational notes. These are not visible during playback but in Advanced display level can be viewed on a "bulletin board," useful for collaborating among team members. Description: Add keywords to validate each page in the transaction to verify that what was recorded is what's being replayed. This can be done through the Validation Panel from the Toolbar or this panel on the Sidebar. Note that keywords must match what appears in the page source, not what's visible on the rendered page. The Advanced display level provides additional keyword match options. Keyword Validation for details. Description: Select an image (picture, Flash) within the page to verify that what was recorded is what's being replayed. This can be done through the Validation Panel from the Toolbar or this panel on the Sidebar. Note that images must match what appears on the page at the original coordinates. The Advanced display level provides additional match threshold and action options. Image Validation for details. Description: The script can be set to replay text input using keystrokes instead of using a text string, and for drop-down lists, it can be configured to select from the list by position, name or value. Description: Populate the event's input field with single- or multi-line text, or set up a script variable to use as input. Description: When set at the Script level, set the number of seconds to wait before timing out any event, and set the action to skip or fail when the timeout occurs. When set at the Event level, the settings apply only to the specific event. Description: DéjàClick replays scripts as fast as possible. 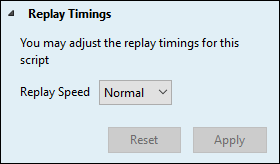 This can be overridden at the Script level to use the recorded pause interval instead, and to modify replay speed as a percentage of the recorded speed. At the Event level, the recorded speed (in milliseconds) can be selected and modified. Summary: Configure how to handle dialogs that may appear during script recording and playback. Description: Under certain conditions, a dialog prompt may be presented during the recording of a transaction. There may be a login pop-up, certificate dialog, or other pop-up requiring confirmation. DéjàClick Dialog Prompt property panel allows the user to account for that. Dialog Prompts. Description: Configure the number of skipped events that can occur during replay before stopping. Description: During the replay, DéjàClick finds the target objects (buttons, images, links, and so on) by comparing the recorded web page information with the actual web page. Possible matches for the target object are ranked by their "match score", and the closest match is selected. This way, DéjàClick can proceed even if the page differs slightly from what was recorded. Low match scores, however, mean that the actual page content differs too much from what is expected, and the originally recorded objects, probably, do not exist on the page. Ignore named attributes, Match Type, Fingerprint Search, ElementPath Search and Breadcrumbs Search - are not supposed to be changed by the users, unless instructed to by the AlertSite support team. 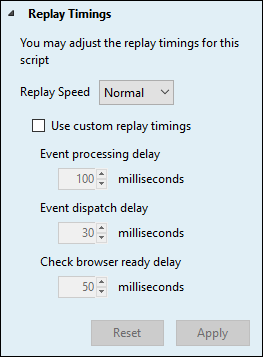 Description: Change replay timings for the script/event from Normal to Faster or Slower (Basic display level). The Advanced display level allows selection to apply delays to other replay timings. Description: A list of custom variables that can be used in Input events (see Event Input (text) above). Script variables added here will be available from the Select... dropdown in the Event Input properties panel. Script Variables for details. Description: A list of datasets that can be used in Input events (see Event Input (text) above). Datasets added here will be available from the Dataset: parameter in the Add token dialog when adding a dataset type script variable token in the Event Input properties panel. Specify custom proxy settings for your DéjàClick script. They will override Firefox proxy settings during script playback. For details, see Browser Preferences. Merge Values (Default) – Append a custom value after the default runtime value for this header, separated by a comma. Replace Value – Use a custom value for the header and ignore the default runtime value (if any). Description: This is a list of URLs to be excluded from script processing. They can be set to be ignored (loaded but not included) or blocked (not loaded) in Advanced mode. URL Exclusions for details. Description: Enables reporting for different domains, e.g., create a ContentView for just the home domain, one for third-party domains, and one for ads. ContentViews for details. Description: Page-render timings that reveal the actual perceived user experience for when the page first starts to render and when it stabilizes. This is an optional feature for both Usage-based and Plan-based AlertSite accounts. See User Experience Reporting for additional information. Description: This is a list of URLs to be excluded from script processing. They can be set to be ignored (loaded but not included) or blocked (not loaded) in Advanced mode. Branching Logic for details. Description: Flash objects can be loaded and run but hidden during replay to speed execution time if the Flash interaction is not necessary for replay. The WMODE attribute can also be modified to ensure that Deja can "hear" the click event. Description: Manually adjust how recorded URL location changes are handled. Description: Manually adjust how recorded content changes are handled. Description: Manually change how recorded network activity is handled. Description: Override the default screen capture method. Some Flash content may require this to be enabled in order to appear in the Screen Capture image.